Today’s post is the second in a 2-part series on wood displays. We’ve been discussing the trend toward natural products and the importance of reinforcing a brand’s commitment to environmental responsibility at the point of sale by using natural materials like solid wood in its POP displays. If you missed Part I of this series, it’s worth reading since we provide additional background on wood displays, provide a set of reference blogs we’ve posted on wood displays, and share numerous examples of solid wood displays, all of which we manufactured in our millwork shop in the San Diego area. Today, we will share an additional 11 examples of wood displays that we hope will inspire you to consider using solid wood as a primary construction material in your next POP display. 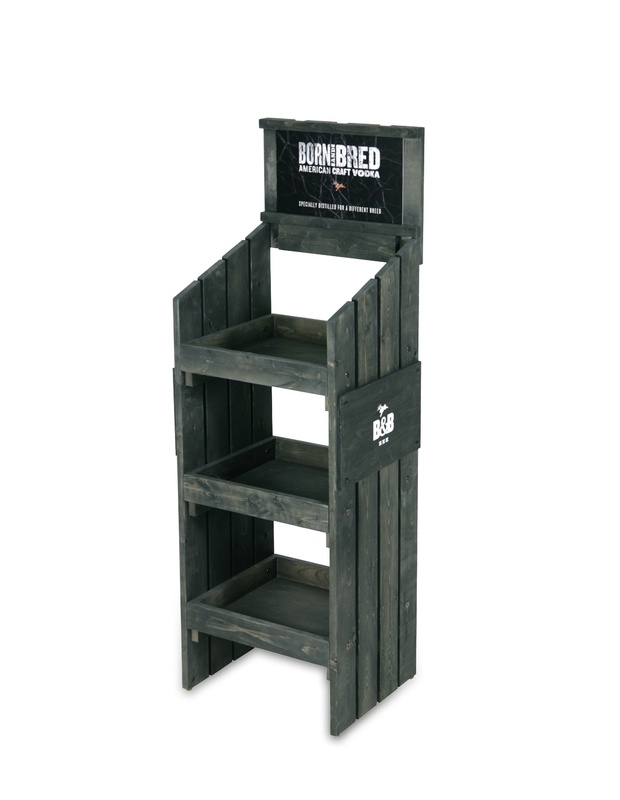 Our first example is a wood shelf display we did for craft vodka brand called Born and Bred. We manufactured the display out of solid pine and added a charcoal grey stain finish. We included solid wood side signs with screen-printed branding and a removable digitally printed PVC header sign. 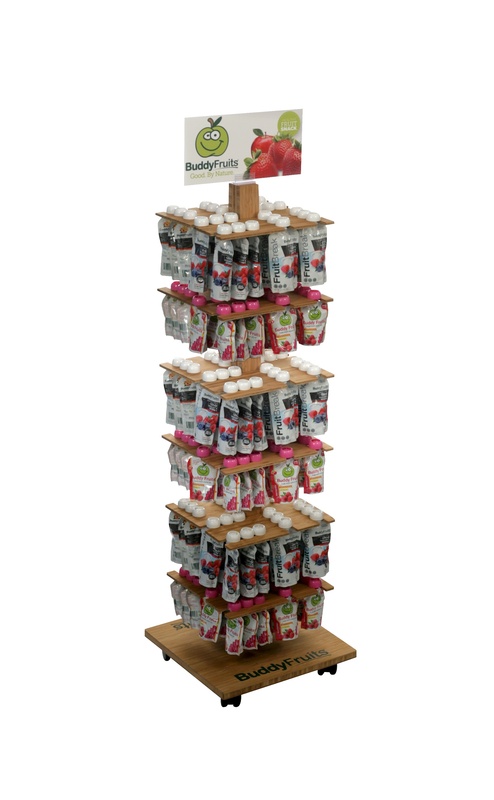 Our second example is a 2-sided, 4-shelf, low-profile floor display we made for Ouhlala Gourmet’s line of BuddyFruits pouches. We constructed the display out of solid pine wood with plywood shelf bottoms. We added silk screened branding on the shelf fronts and sides, clear tag molding, locking castors and slide-in PVC side signs. This is a great merchandiser for the produce section of any grocery store. 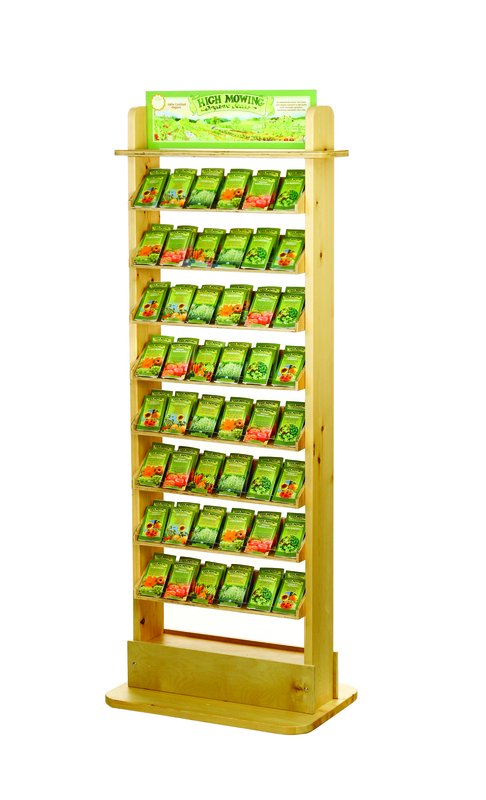 Third, we made a taller, slimmer 5-shelf display also for BuddyFruits. 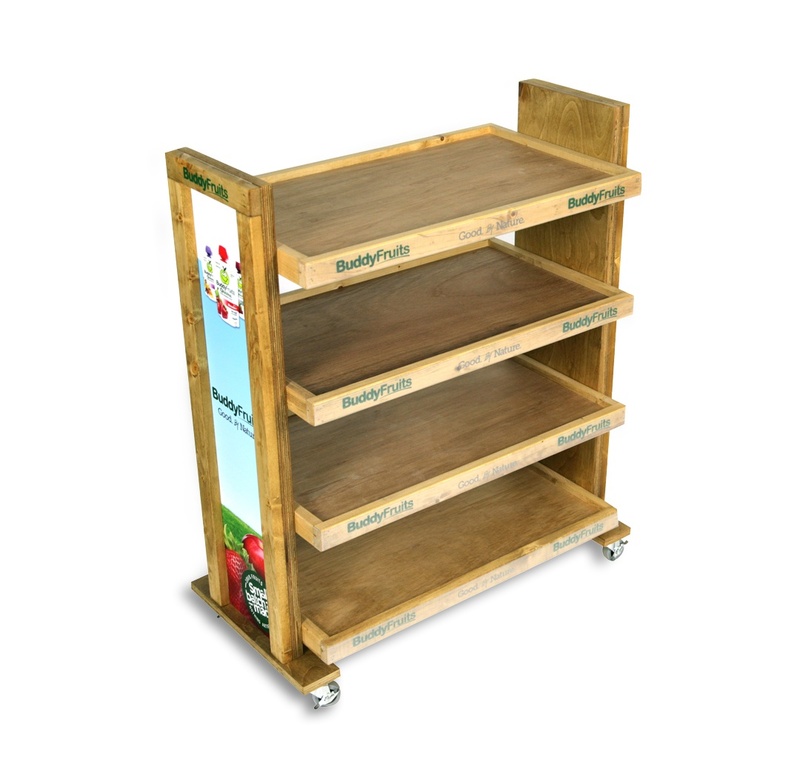 This was also made of solid wood with castors and included slanted shelves with clear plastic shelf tag molding and removable shelf graphics, permanent silk-screened branding, and a PVC header sign. Fourth is a variation of the above display. 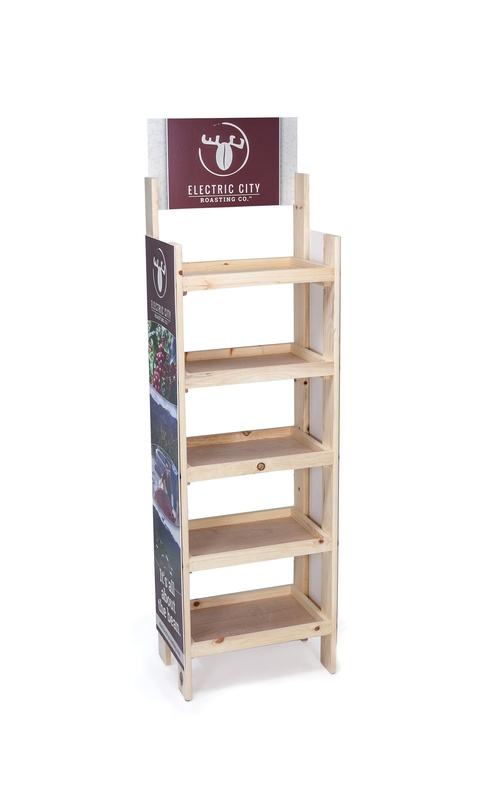 This one, shown below, has the same basic construction but includes 6 shelves, a darker wood stain finish, PVC side signs, and a die-cut PVC header sign with Cliff Bar branding. 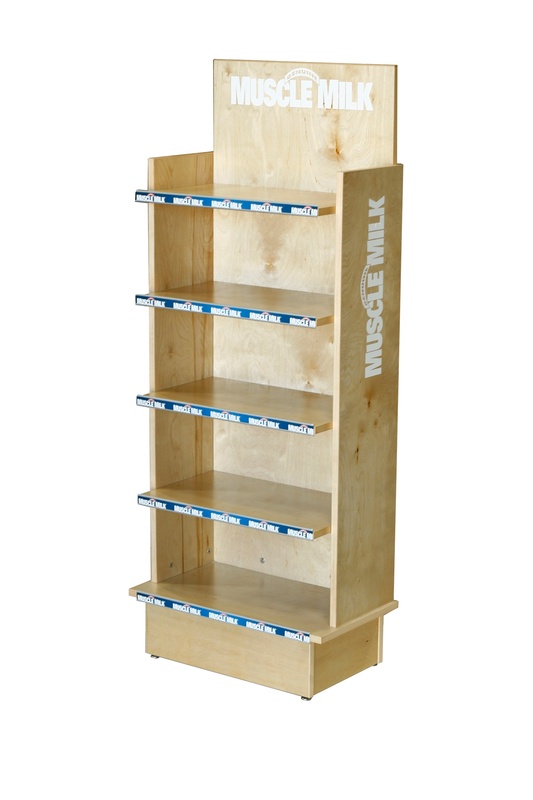 Our 5th example is a simple 5-shelf wood display we made for Muscle Milk. On this one we used pre-finish China birch and included an enclosed base and screen-printed graphics on the sides and back panel header. This display could be made either knock-down or fully assembled. Sixth, High Mowing Seeds was interested in a solid wood display for its seed packets. We made this 8-shelf, 2-sided display out of clear-coated pine. Its construction was very basic and the only branding we added was a PVC header sign, but it would have been easy to add side and shelf graphics had the budget been available. Number 7 below is a grab and go display we designed for BuddyFruits squeezable fruit pouches. We constructed this one out of solid bamboo and designed it so the pouches could hang from the neck of the pouch. 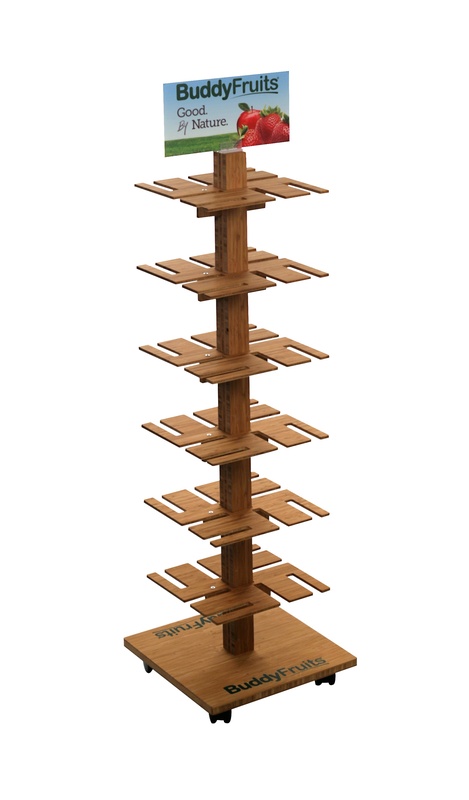 The solid bamboo base included wheels and had screen-printed branding on two sides. The display also had a 2-sided header sign. It knocked down in a small box for cost-effective shipping. Our eighth example shown below is a customized version of our stock WD-20FLP display. 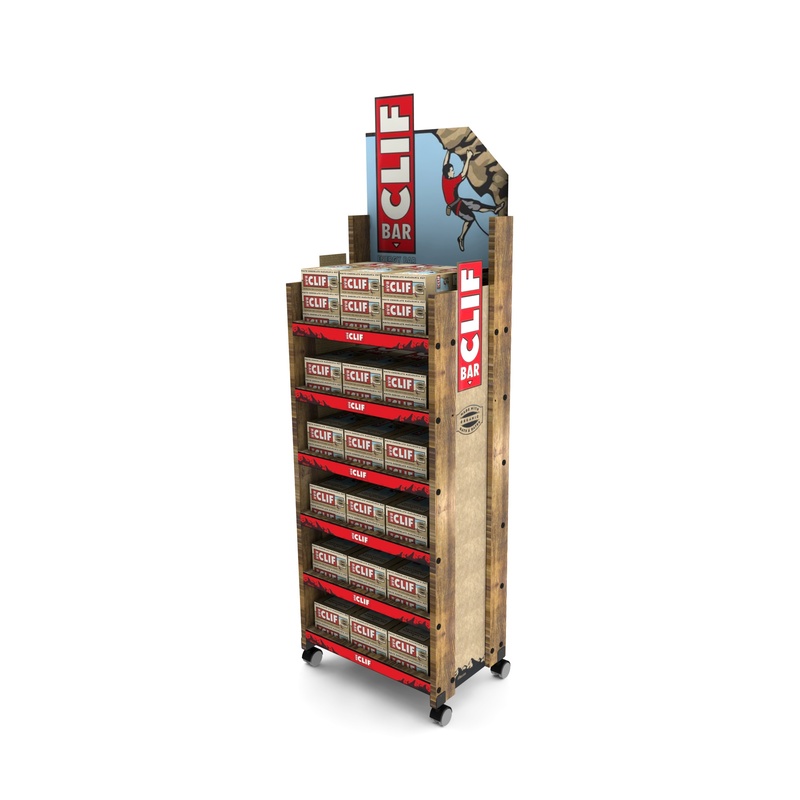 This is a standard 5-shelf floor display constructed of unfinished solid pine with PVC side and header signs to promote the Electric City brand. 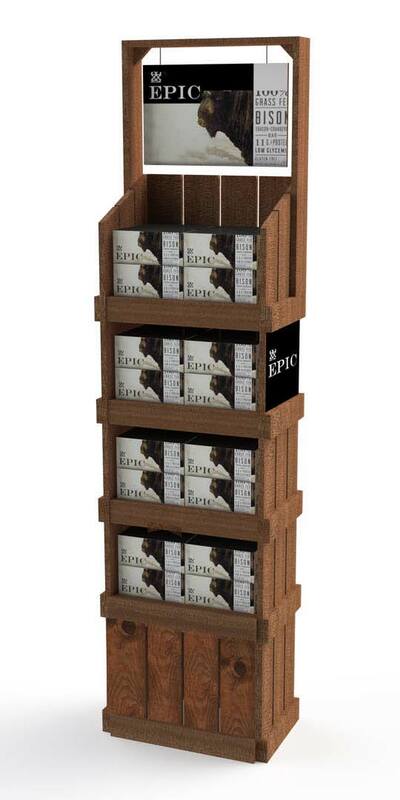 The Epic display shown below has more of a wood crate feel. This 4-shelf display has a bit more of an interesting design in part because of the use of wood planks, darker stained finish and hanging sign. For additional branding, we added side PVC signs. This display would look good in almost any retail setting. Our 10th example is a 4-sided, open format shelf display constructed of solid milled lumber uprights and pre-finished birch shelves. We incorporated 4 die-cut PVC header signs for 360- degree branding. The display knocks down for efficient shipping and storage. We have shown a lot of examples of wood displays constructed of solid pine, some of which are stained and others which are left natural. Pine is a cost-effective soft wood which is an excellent choice for making wood displays. 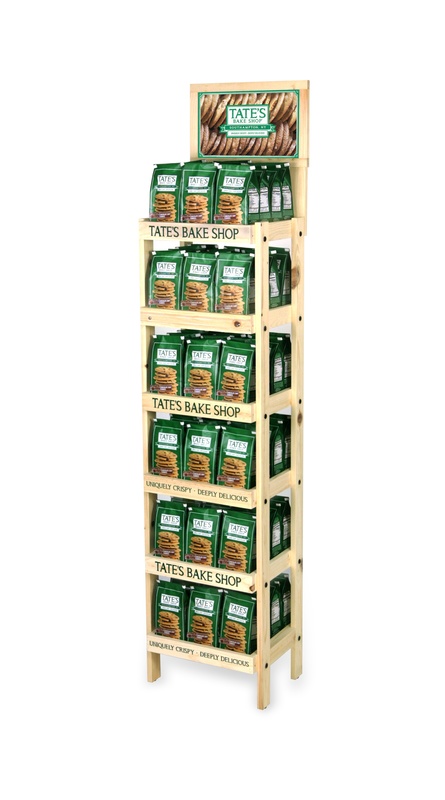 Our final example today, the 6-shelf wood display shown below, was one we made for Tate’s Bakeshop. Like a number of the other examples, this display features knock-down construction, permanent shelf branding, and a removable header sign.